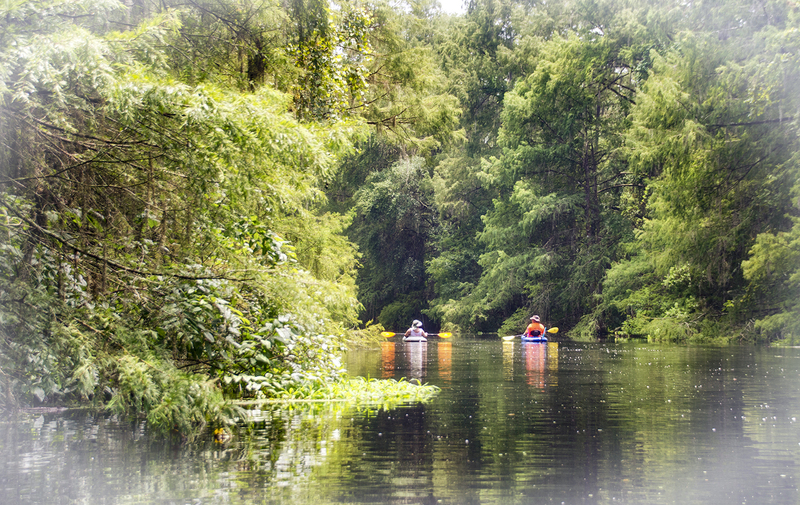 Prairie Creek is part of the Potano Paddling Trail, that includes circumnavigating Newnan’s Lake. This is a Florida State Designated Trail. 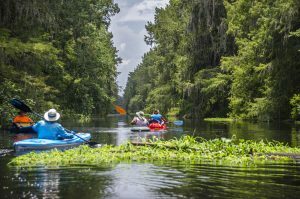 Prairie Creek drains Newnan’s Lake, flowing into Paynes Prairie State Preserve and Orange Lake. 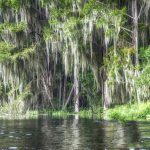 At one point Prairie Creek provided needed water to Paynes Prairie but in the 1927 Camps Canal was built in order to alter the flow of the creek into Orange Lake through the River Styx. Prairie Creek offers a unique and diverse paddle just on the outskirts of town. 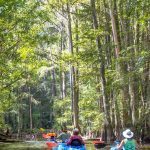 For five miles the creek offers the opportunity to view it’s wildlife such as small gators, egrets, herons and deer as well as the amazing canopy of Bald Cypress, Oaks, Fridge Tree and Pines. Depending on the water level, Prairie can be a bit tricky both in high and low water levels. Downed trees, and branches may need to be maneuvered as well as keeping on course during very high water levels. You will also not be able to pass under the bridge at Highway 20 where the creek flows underneath. 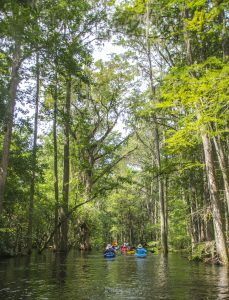 It’s an enjoyable paddle into the Prairie Creek Conservation Area, dwarfed by tall hardwoods into a freshwater swamp habitat. Location: This section of Prairie Creek is located 5.8 miles SE of Gainesville on HWY 20. 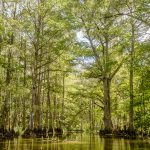 Kate’s Fish Camp, visible on the North side of HWY 20, is located just under a 1/4 mile South of the creek’s start on Newnan’s Lake. Launch point: The launch is located at Earl P. Powers Park, 5910 SE Hawthorne Rd, Gainesville, FL 32641 on CR 315. See above map. The facilities are nice, plenty of parking and there are restrooms. Additionally you can launch also at Kate’s Fish Camp, located on the North side of HWY 20 on Prairie Creek. See Above map. 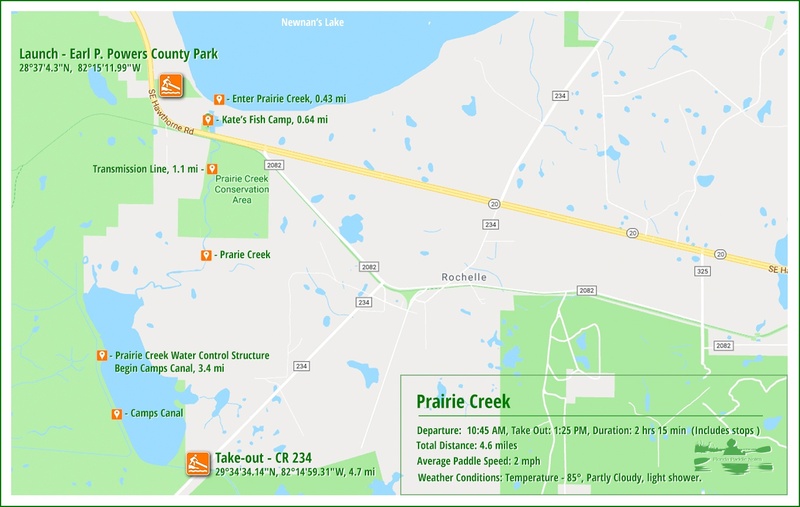 During times of very high water you will have to launch on the South side of the bridge on HWY 20 and carry your kayak/canoe a couple of hundred feet along the Gainesville-Hawthorne Trail. Take-Out point: The take-out is located CR 234 on the SW bank over the bridge. 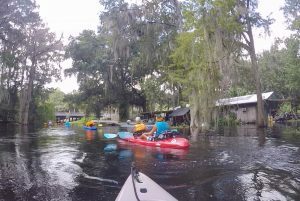 Rentals are available at Kate’s Fish Camp, 6518 SW Hawthorne Road, Gainesville, FL 32641. 3(352) 372-1026. Difficulty: Easy to moderate depending on the water level. 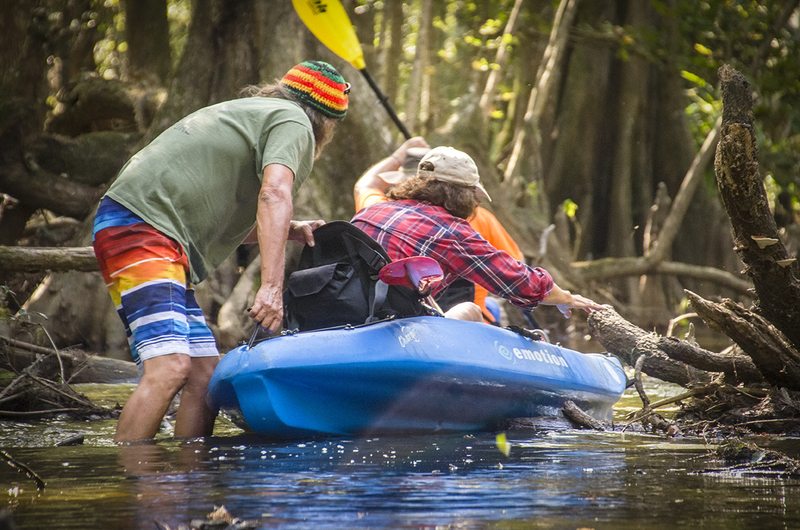 At lower levels there are some trunks in the water that can be tricky to maneuver over and may even require getting out of the kayak to help it off the logs. Average Paddle Time: We paddled this, during high water in 2 hrs 15 min. During lower water levels obstructions may add to the time. 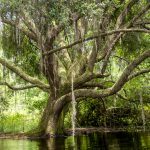 Current – Tidal: Fed by Newnans Lake and rainfall. Rest Areas: There are minimal rest areas, though if nature calls there are some areas, if the water level is right, you may exit along Camps Canal. I suggest using the restroom at Powers Park before launching. In the early 2000’s, drought had limited the ability to enjoy a paddle on Prairie Creek. Water levels were so low it was mainly used as a hiking trail. 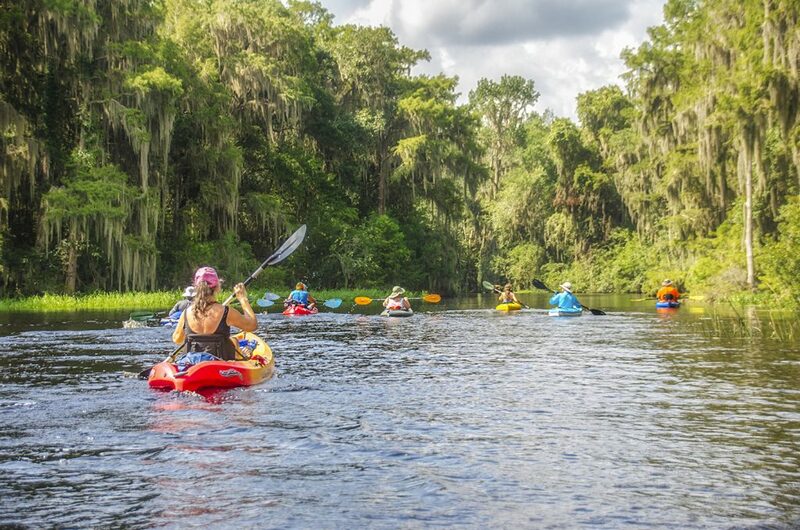 Now, in 2016 – 2018, with the numerous tropical storms and hurricanes, the water level has increased significantly and paddling this creek is a welcomed treat! On this particular trip, Powers Park was very flooded from Hurricane Irma passing through in early September. 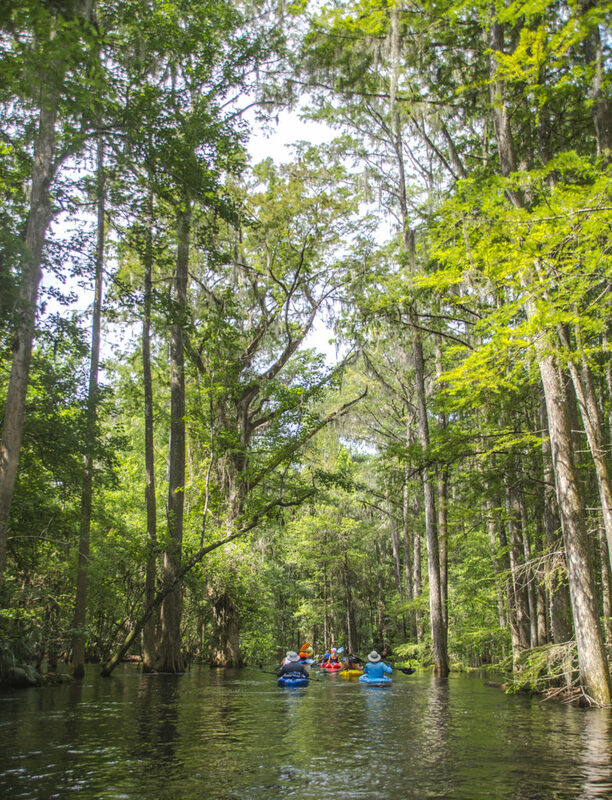 Once launched from Powers Park, and a brief paddle along the Southwest shore of Newnan’s Lake, we entered a flooded Prairie Creek! It was a warm sunny morning when we turned into Prairie Creek from Newnan’s Lake. 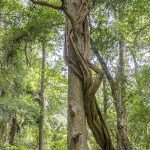 Just 2 years earlier we paddled this same route amid numerous Cypress knees and downed tree trunks. Today the water was high, the trees were lush and we continued the short run to Kate’s Fish Camp. It was not encouraging! The water level at this point was inches from the floor of the main dwelling and the water was definitely rising! This wasn’t a good time for Monica and Mike Carter but they persevered and the business is up and running again! As we passed Kate’s Fish Camp we came to the HWY 20 bridge and realized the water level was too high to get under the bridge. We had to portage up and over to the Gainesville-Hawthorne Trail a few hundred feet and re-launch into the creek. 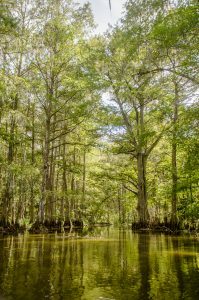 The water was flowing briskly and we entered the darker, canopy covered creek into the swamp hardwood forest. 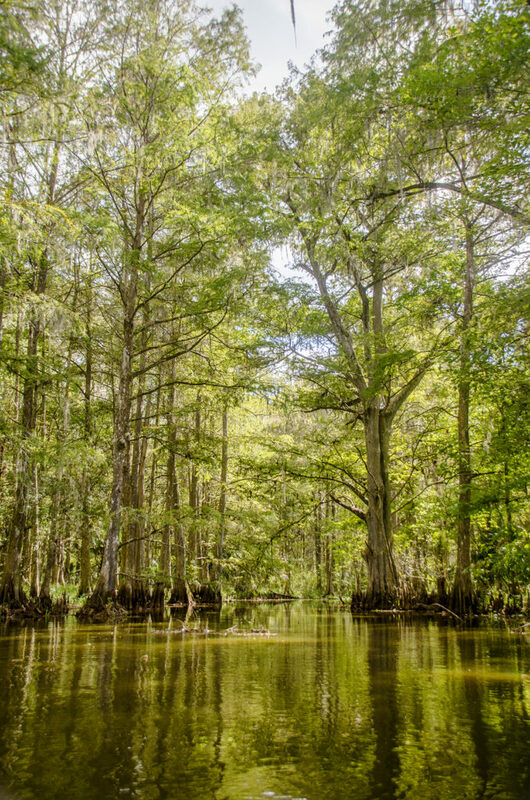 Here were amazingly tall Cypress trees bordering our journey on the flooded waterway. For several miles the creek twist and turns and on this day it was often hard to see the main ‘channel’ due to the high water. 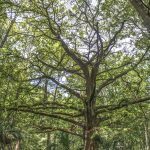 At the 1 mile mark on our paddle we cross under a transmission line in an open area, then return to the dense canopy covered habitat. 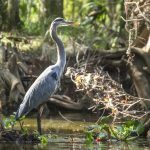 Normally there is quite a bit of wildlife along the creek, but today, we only encountered several Blue Herons, that flew ahead each time we got got close. In earlier paddles, when the water level was a couple of feet lower, it was in this first 3 mile section that we encountered a few obstructions. Fallen trunks and bunched up branches that in higher water are submersed were exposed. Several times one of us had to actually get out of the kayak and help others over the obstructions. This was not an issue on this particular trip. At around mile 3.4 is the beginning of Camps Canal. 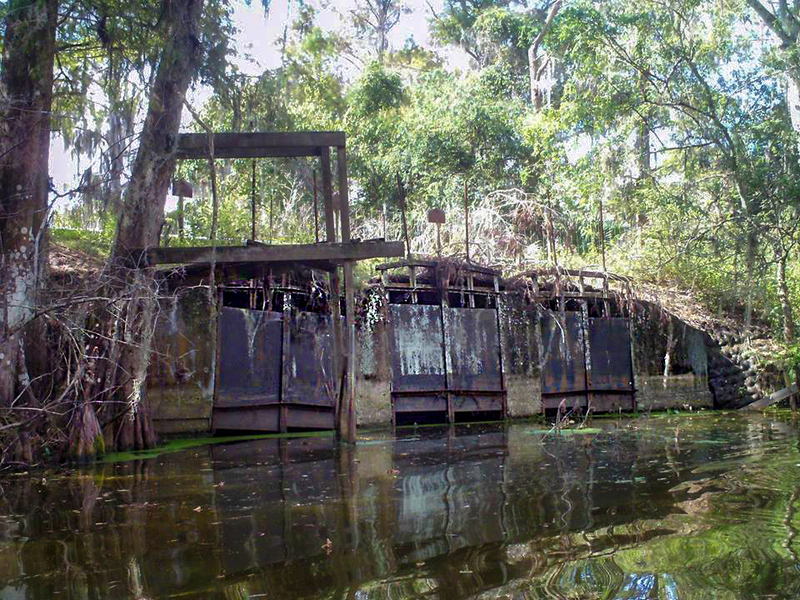 In 1927, Camp Ranch, Inc. dug this canal diverting water from the Paynes Prairie Basin to Orange Lake through the River Styx. 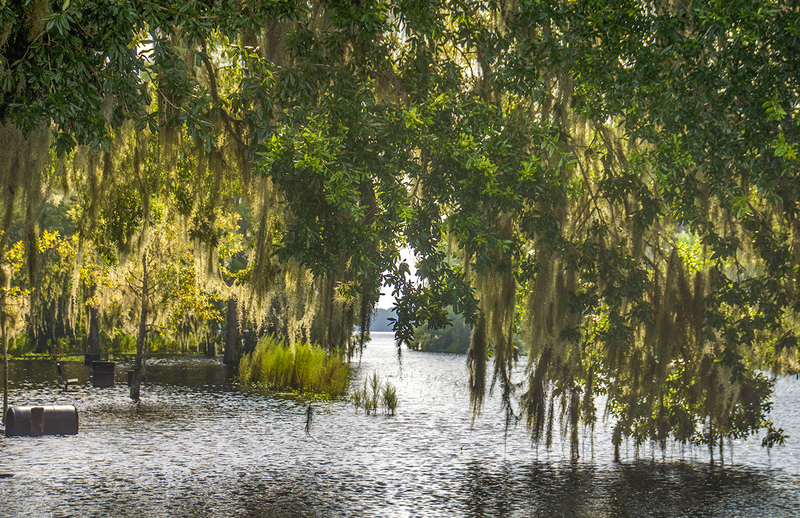 In 1975, the flow of water from Newnans Lake to Paynes Prairie was partially restored. The Prairie Creek Water Contrtol Structure can be seen at mile 3.5 along the creek. This final stretch along the canal is mostly open overhead. 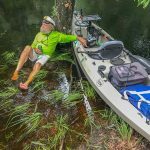 During low water, Duckweed clogs the waterway but on this trip in high water it was clear. Within a mile is the take-out on CR 234.